Obsessed. Addicted. Ravenous. Passionate. Dedicated. About chicken wings, you ask? Yes. WINGS ARE EVERYWHERE. Within my lifetime eating Buffalo wings since the 80’s, I’ve seen prices of fresh chicken wings at the grocery store go up 200% or more, and we’ve now reached a point where “hot wings” appear on the menu of every sports bar worth its draft beer list. There is now a Buffalo wing cult of epic proportions stretching from Canada to Mexico and beyond. BUT like all cults…there comes a time to purify the tradition. Think about it: in 1964, the Buffalo-style chicken wing tossed in hot sauce was first served at The Anchor Bar. The recipe was spicy, exciting, glorious, and perfect in its simplicity. HOT SAUCE + BUTTER. Add to this simple sauce recipe the BLUE CHEESE on the side, which makes a perfect flavor compliment and also cools off the heat. Dip some celery & carrots in it for a crunchy contrast to the crispy meatiness of the chicken. HOT SAUCE + BUTTER + BLUE CHEESE = BUFFALO WINGS. This is the original. Anything different is NOT BUFFALO. What about barbecue? What about boneless wings? What about dry rub? NOT BUFFALO. The Wing Authority is about the original tradition. To us, Buffalo wings have a standard to live up to. While hot wings are everywhere, there is no standard to define what makes a true Buffalo wing. This is a problem. Think of the last time you had wings with friends. You probably heard orders for boneless wings (whatever that means), or teriyaki, barbecue, or lemon pepper wings. 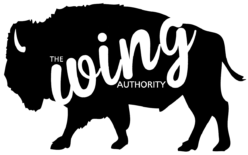 You talk about how much you all love wings or hot wings, but here’s the thing, and The Wing Authority is here to make it clear: YOU AREN’T EATING BUFFALO WINGS. That’s the mission: WE SHALL OBSERVE AND PRESERVE THE BUFFALO WING TRADITION. The Wing Authority does not try to eat the hottest wings. The Wing Authority does not try to eat the most wings. The Wing Authority does not search for the “best” wings. the tradition and heritage of real Buffalo-style chicken wings must be preserved! The Wing Authority surveys the landscape of spicy chicken wings and will report to you whether these wings are BUFFALO OR NOT BUFFALO. Stay tuned, and thank you for visiting.